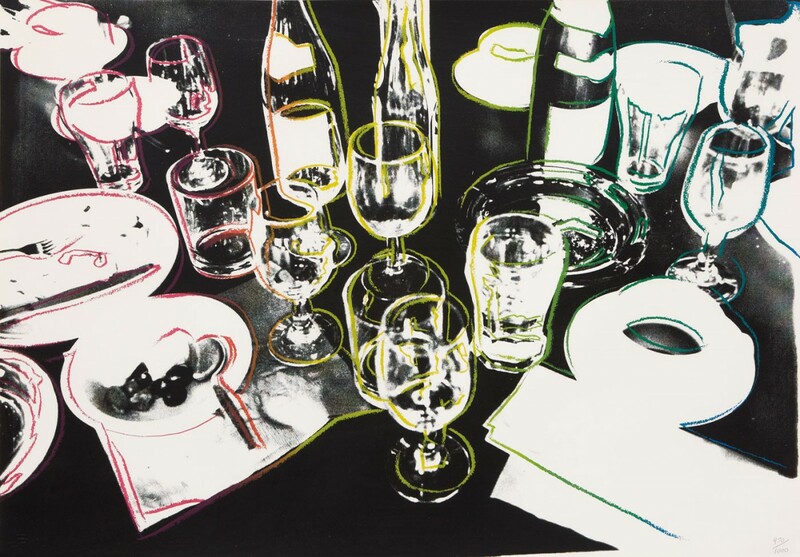 Warhol's print After the Party depicts what would otherwise be a black and white photograph of scattered glasses and plates, brought to life by the rainbow gradient highlighting the scattered objects. There is an inherent chaos in the work, a feeling of excess, in part due to the reflective quality and haphazard arrangement of the glasses, the bright hues that outline the items, and the manner in which the print was created and aligned. The subject and the print itself suggest the residue of a frenzied, yet enjoyable, gathering through both compositional arrangement and artistic liberties taken by Warhol in the creation of this print. Numbered on the lower right and contains stamp from the Estate of Andy Warhol and the Andy Warhol Foundation for the Visual Arts, Inc. In excellent condition. ?